We visited a nice little Italian Restaurant near our home the other night and succotash was a featured menu item. Up until this moment the thought never crossed my mind to make succotash. It was wonderful and I knew I had to figure it out. 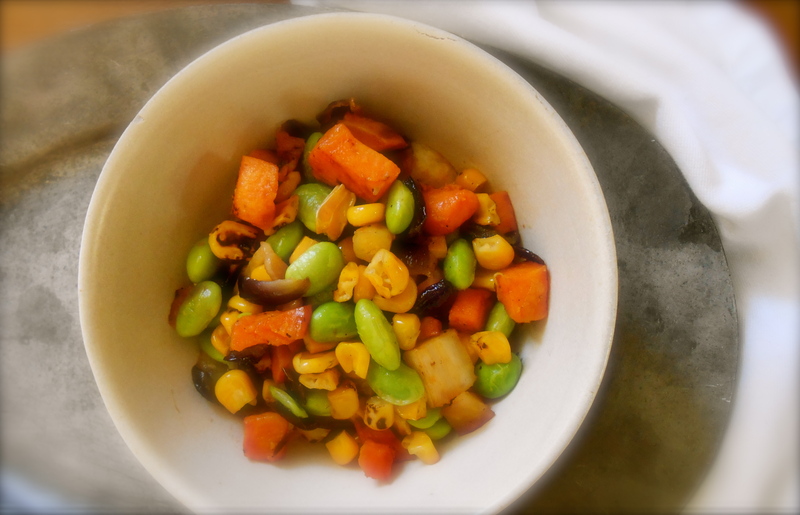 After spending a little time looking through succotash recipes and finding several variations to this sensational mix of vegetables (specifically corn and typically lima beans) I settled on the idea of roasting root vegetables, and using edamame instead of lima beans. What we enjoyed about the succotash at the Italian Restaurant was the corn was fully roasted. Knowing corn is no longer in season I decided I would buy frozen corn and “pre-roast” it prior to adding to the mélange. However, I discovered frozen “roasted” corn at the market! I highly recommend using roasted corn kernels for this recipe. Buying it pre-roasted or roasting it for 30 minutes in a 350°F oven will certainly add wonderful flavor to your roasted succotash! The combinations of both texture and flavor created an exceptional autumn side dish. Preheat oven to 400°F. Toss the sweet potatoes, parsnips, red onion and garlic with olive oil and place on a parchment lined baking sheet. Make sure to spread in a single layer. Sprinkle with salt and pepper. Roast until vegetables are tender, occasionally moving around with a spatula for about 30 – 45 minutes. Mix in the edamame and corn. Roast until all vegetables are tender, about 10-15 minutes longer. I just realized how strange that sounds….frozen roasted corn! Ha! Well, it really was delicious and don’t imagine you finding edamame in your part of the world? I have seen it at a chinese restaurant once, but not in a supermarket or something similar. Me too. Isn’t the texture of edamame so much better than lima beans? Thank you! Marvelous! Had never ever heard of succotash but if it is what this is, then I LIKE! It’s the kind of texture I just really relish. Me too! I love foods that have a combination of different textures. This one was particularly texturized. Soft sweet potatoes and firm edamame, to name a few. Thank you for your comment! :) Nice to hear from you. What a healthy and colorful side dish! Great ingredients! Beautiful photos! Looks delicious. Succotash is definitely one of my favorites! I love the addition of the edamame. Thank you! I am a new fan of succotash and I’ll be making it quite often now. I have had a few different versions now and this one is perfect for the weather we are having. Have you had it as a cold salad before using a few raw vegetables? Wonderful. I have eaten this same dish also & loved the combo! You recreated it at home, I love it! Isn’t it wonderful! I have had it with red peppers before too and didn’t care of it too much. Too overpowering. This combination was perfect in my opinion. Wonderful combo. How on earth did it get that name? There must be a great story there! What a pretty dish! I have never had parsnips before. I like almost all roasted vegetables so will have to try this. Thanks for sharing! Yum. I adore succotash. In fact we love just about anything containing corn. I make mine more like a cooked salsa, with cherry tomatoes. Really love the root vegetables in yours though – that would make it much more substantial as a main meal. Also love that you’ve used edamame, which I much prefer to lima beans. Our weather has improved at last! Off to the beach now for breakfast. 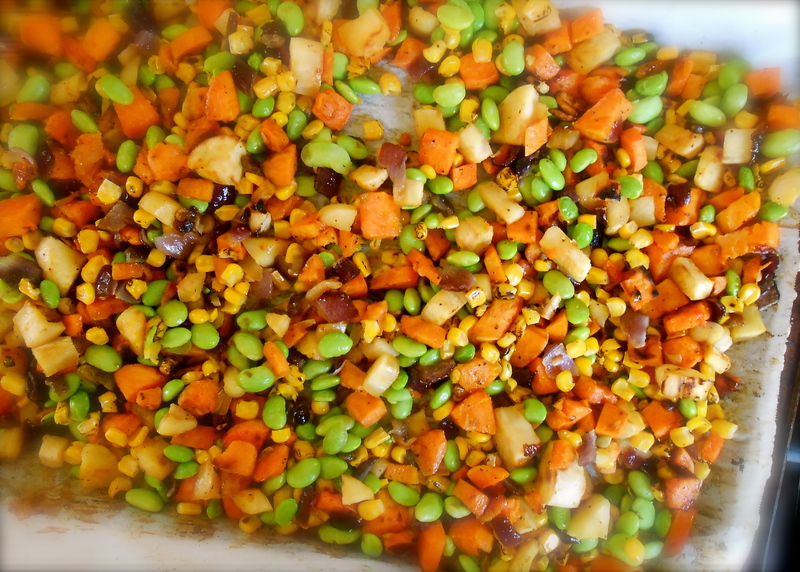 Here’s my succotash recipe! I was wondering if this could even be classified as succotash. When you google succotash there are so many different versions. We have had it at a BBQ house and it was served as a cold side. Bell peppers, raw onion, corn, lima beans and a vinegar-y flavor….hmmm. I think I do prefer it “my way”! That’s very smart. I always thought succatash a bit boring and soupy. *smacks forehead* Roast. RIGHT ON! haha! Thank you Janet. Love your comments. I was opening this post and wondering why I’d never made succotash. Lo and behold! That’s just about what you said in the opening paragraph. I really do like the mix of vegetables that you used here and subbing edamame for lima beans works for me. I’ve never seen frozen roasted corn but I’m certainly going to look for them. They’d bring a nice flavor to not just this dish but quite a few others. I was very surprised when I saw the frozen roasted corn. Trader Joe’s! :) Certainly was a short cut because I was going to “pre-roast” the corn before roasting it! Ha, now that seems a little odd…but I do think having the corn “very” roasted is key here. Maybe some day you’ll try it, it certainly is an easy meal to put together. I didn’t know succotash was a thing! I thought it was just a word that existed on Tom and Jerry – haha! Thank you for opening my eyes! Haha that would have been perfect! But I think your recipe outshines any Tom and Jerry reference! This just screams fall, the colors, the combination of roots. How beautiful and so delicious, love your take on succotash. I loved the root vegetables you used – and your roasting technique. What flavor this must have! Lovely! Sounds delicious and flavorful! Yum! Love this recipe because it’s so bright and pretty!! I can see it alongside a Thanksgiving turkey. thanks!! The great thing about being so behind in blogging and reading blogs is that by the time I get here – the comments are a whole new source of info! I’ve never made or had succotash but am intrigued to try now. And looking forward to writing “suffering succotash” on my chalkboard menu! yet…I can eat them if they are fully cooked as in chocolate zucchini loaf. go figure. I guess it changes the proteins or something. You are currently reading roasted succotash at COTTAGE GROVE HOUSE.